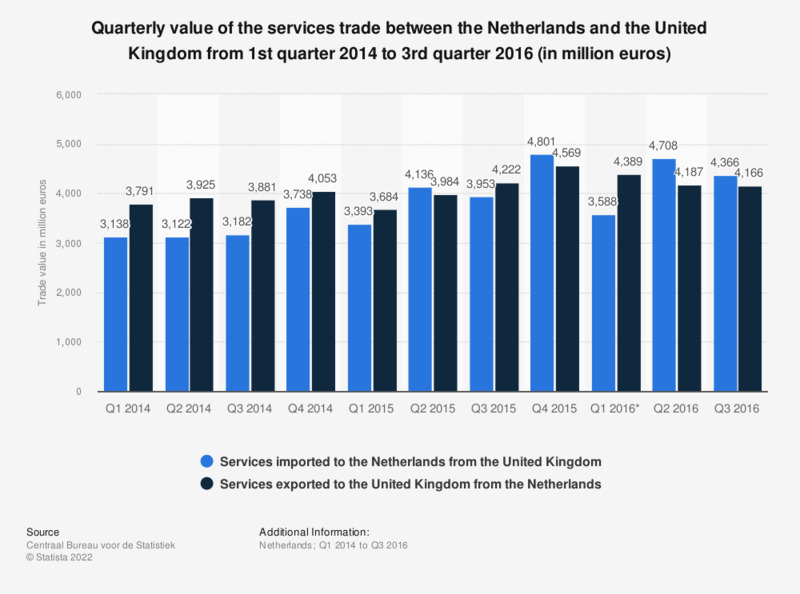 This statistic displays the quarterly value of the services trade between the Netherlands and the United Kingdom from the first quarter of 2014 to the third quarter of 2016. It shows that in the first quarter of 2016 the Netherlands exported more services to the United Kingdom than it imported. The source defines services imported as: the value of services delivered to persons and companies in the Netherlands by foreign persons and companies. The figures include the spending of Dutch travellers abroad. Services exported is defined as: the value of services delivered to foreign persons and companies by Dutch persons and companies. The figures include the spending of foreign travellers in the Netherlands. The source adds that the import figures include subsidiary companies of foreign parent companies based in the Netherlands and exclude subsidiary companies of Dutch parent companies abroad. * All figures for 2016 are provisional. Statistics on "Cheese market in the Netherlands"